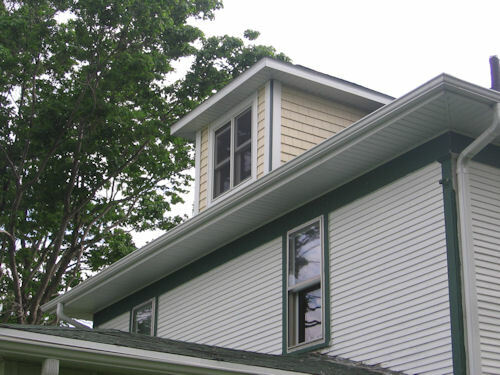 One of the finished jobs this weekend was to scrape and paint the 2nd story of the east side of the house. It’s nice to have this complete – for the house proper all that remains is the 2nd story west side and the whole house will have been painted in the last 6 months. Then it’s time to think about the attached garage. 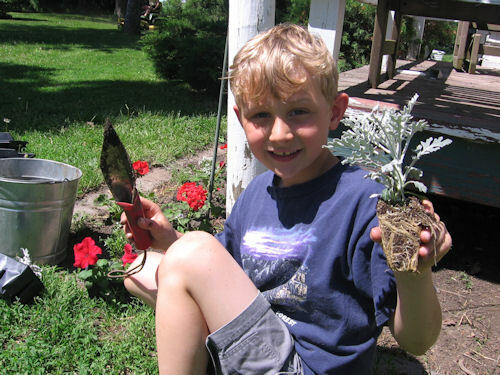 Martin went with mom to the greenhouse and was so excited about the possibilities that he insisted on buying some flowers by the front of the house with his own money. Now it’s time to get the plants in the ground! I’ve made a commitment to paint part of the barn (I bought 9 gallons of stain). We’ve never painted the barn, so we are starting on the easy sides, the west and east sides. I’ll have to think some more whether we attack the north and south sides with their more dizzying heights above the ground and figure out how to reach there. It’s so weathered that’s there’s not much scraping to do as most of the paint is gone. 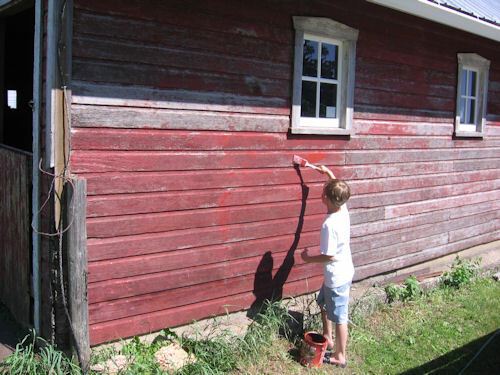 Martin was excited to do what he could to help stain the barn. It’s more like pouring the stain on rather than brushing as the boards are very thirsty. 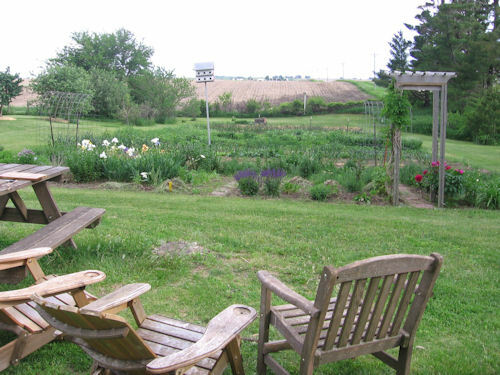 Here’s one of the gardens this spring. 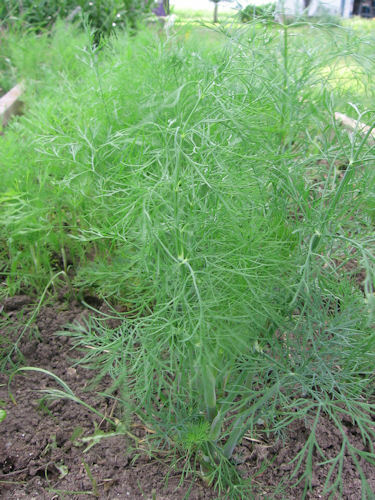 There’s been a big weeding and planting push lately and we’re probably 75% complete. Come in, have seat and rest for a while in one of the garden view chairs! 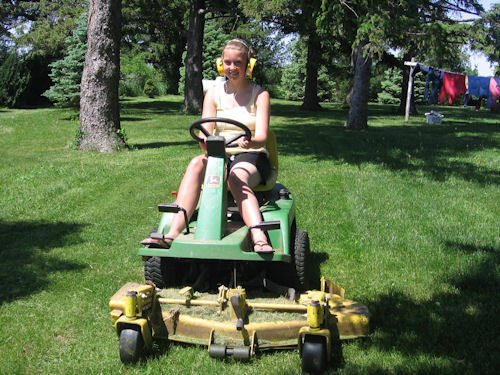 We’re still at the point in time where the girls fight to see who gets to mow the lawn. Part of it is driving the nearly ztr JD 525 mower. Always stylin’, Emma makes sure her shirt and ear protection are JD yellow! The hops are on the fast track again. 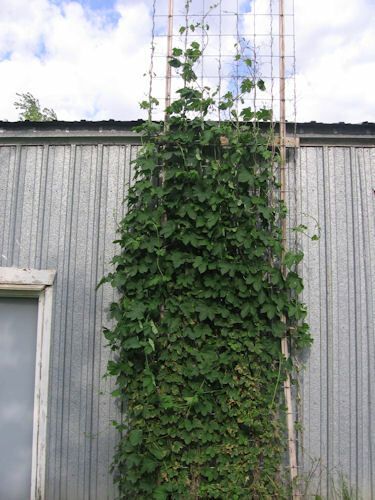 The top tendrils of this vine has already reached 16 feet high this growing season! 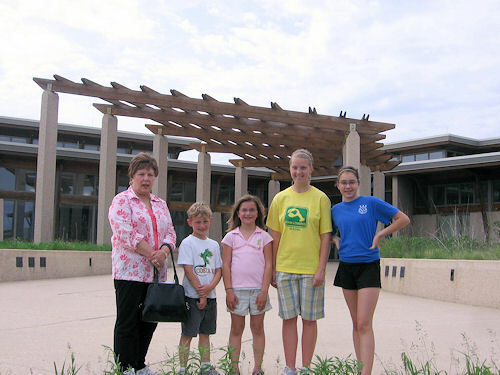 We went to visit Neil Smith Wildlife Refuge – one of the largest prairie reconstructions ever attempted. 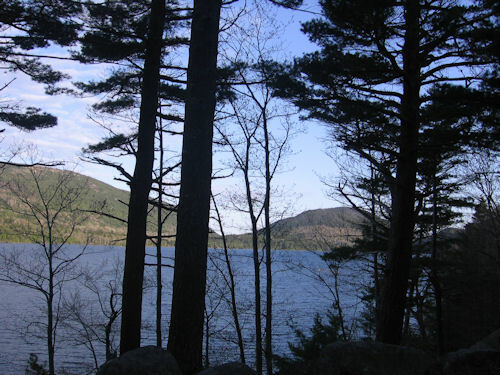 When complete, it is projected to be 8,000 acres. 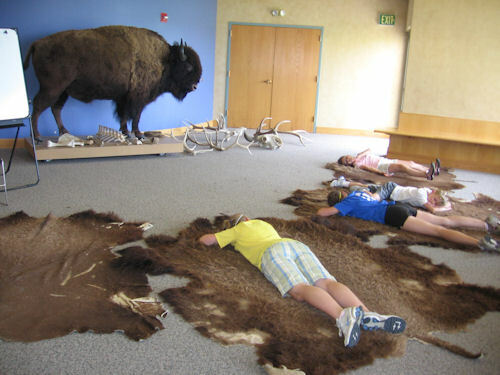 There’s an nice interpretive center where the kids took a break on some old skins. With Nana in front of the center. 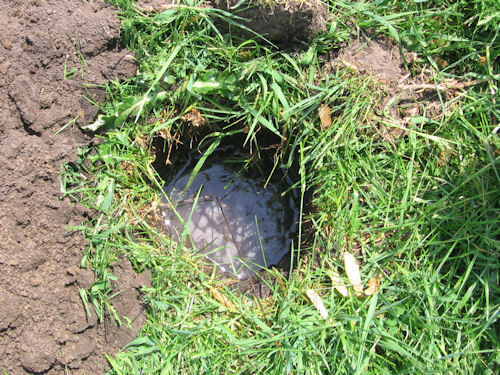 We are soon to get a new septic system. Ours is rather archaic and it’s time for a new one (I’ll spare you all the cruddy details). The guys who are putting it in, said we could save a bit of coin if we did our own percolation or “perc tests” to see how big of a drain field we’d need based on the drainage characteristics of our soils. First, you dig four holes three feet deep, mark a point a few inches below the surface, and fill the hole with water and measure how far it has dropped in a certain time period. Repeat this until three readings are close to each other (the first few readings, the drop is large as the soil saturates. 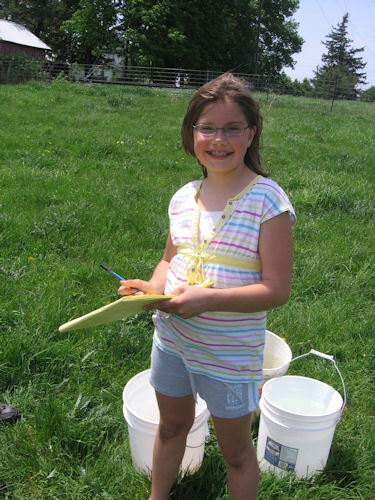 We had a helpful recorder so we could haul water and time measurements. The cousins from Minneapolis came down for Memorial Day weekend. That means it’s time to take out the chimenia once again. We burned wood from some dead branches we cut up after using the chain saw, tractor loader, and two brothers to get down. 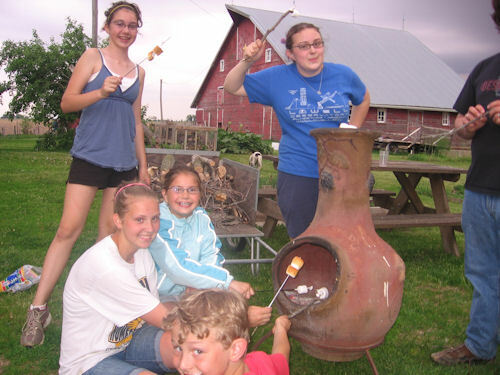 The chimenia is great for roasting marshmallows to a golden brown (check out Emma’s). 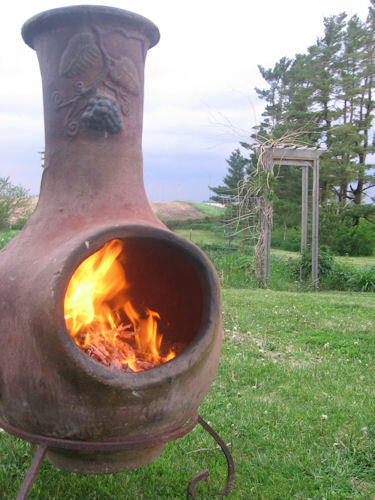 I like the chimenia since it is portable, it can be moved around the yard, depending on the wind and not leave a burned spot on the ground. I know we’ve been missing in action for a few weeks. I’ve finally resolved that it is ok if I don’t post every day after 2 1/2 years of daily posts. 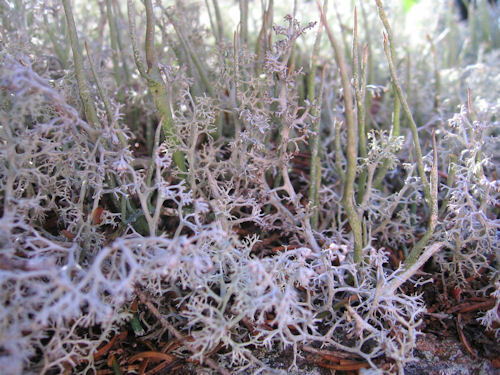 After falling behind due to the trip to Maine, and spring bursting out, time for blogging, or anything else, has been sparse. 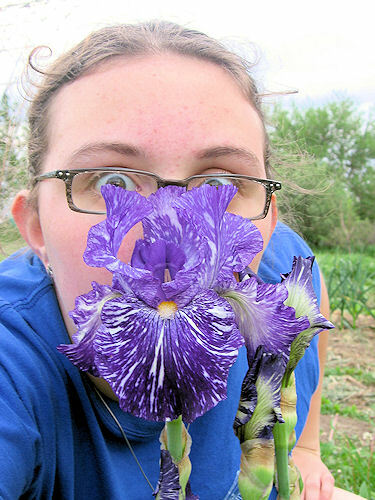 A promise to return soon and this goofy picture of Claire will be the best I can do until I return to semi-regular posts. My favorite hike of the trip was around Eagle Lake. 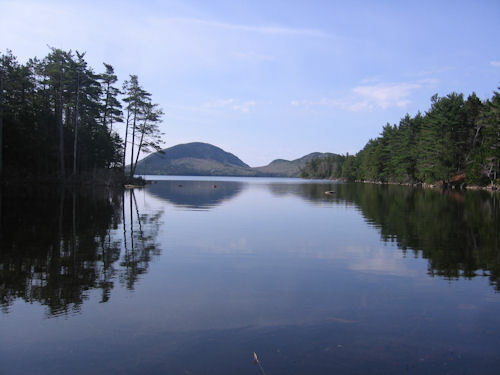 Here’s the lake in all its calm splendor. 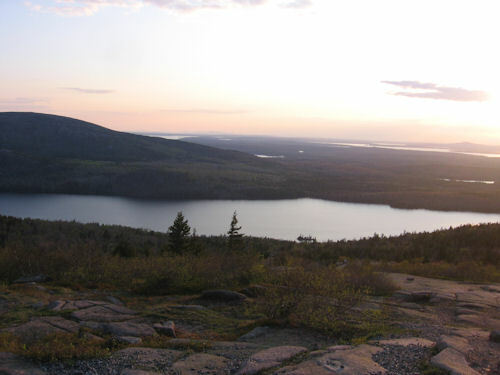 Acadia National Park was the first National Park east of the Mississippi River. 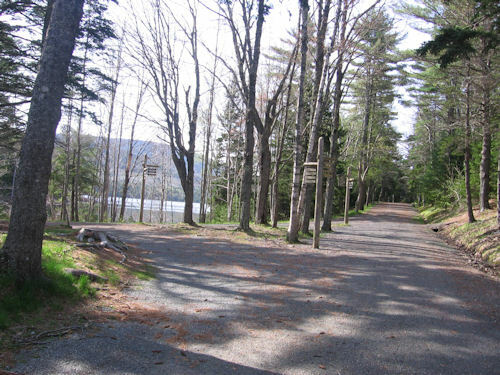 The park has over 50 miles of “carriage roads” around lakes and through the forest. 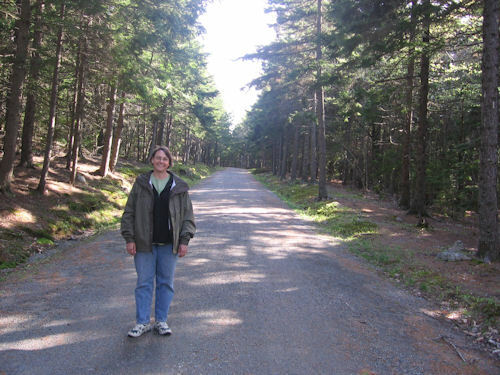 They are great for easier hiking, biking, or cross-country skiing. They were built by Rockefeller before the park was founded, so he’d have a pleasant place to ride his carriages! Now the trail is starting to go uphill away from the lake. 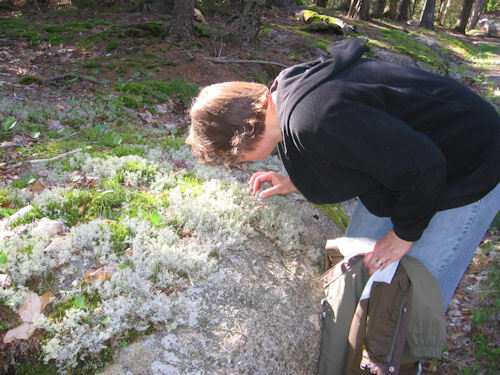 One of the dangers of hiking with Linda is that she’sÂ not yet met a bryophyte she didn’t like. Here’s a close up of the latest object of her affection. Continuing further up the carriage trail. 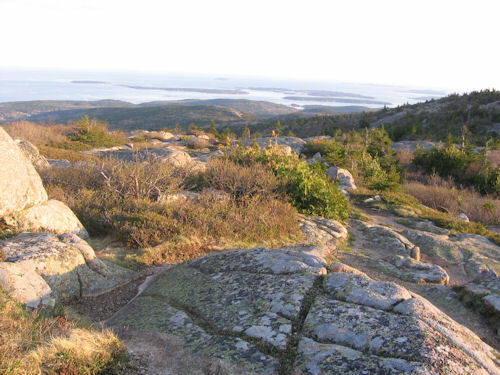 Finally, a view of the lake from up near Cadillac Mountain. 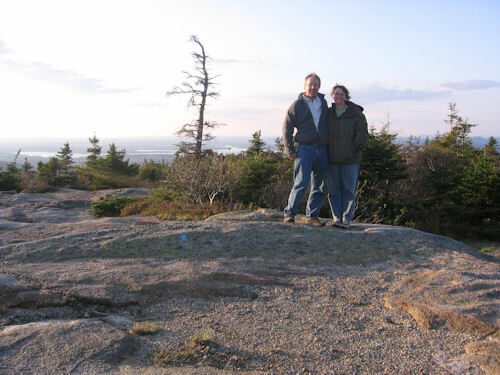 We cheated and drove to the top of Cadillac Mountain. I say cheated because I’m with Edward Abbey that not every beautiful place in the world should be accessible by auto. There are hiking trails to the top of the mountain, but it is disconcerting to get to the top and find a parking lot and RVs. Abbey believed that the true splendor should take some sweat and effort, to help appreciate the journey. Here’s proof that we were together on the trip, thanks to the self-timer on the camera. A view to the north, I believe. And a look towards the south. I was struck at this place at the similarities to Olympic National Park in Washington overlooking Puget Sound. 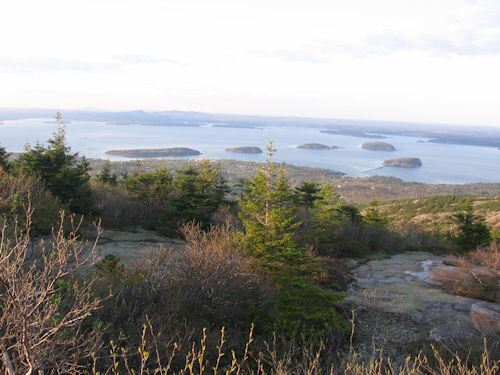 The two parks are bookends to the northern coasts of the US, with Acadia being the drier, shorter version of Olympic. I marveled at all the parts of the world I have yet to visit and for a moment was overwhelmed with all the unseen beauty across our planet. 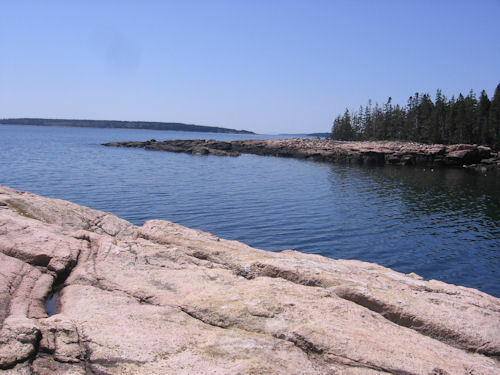 One of the hikes was to the mouth of Ship Harbor for lunch. This is on the extreme eastern edge of the park. 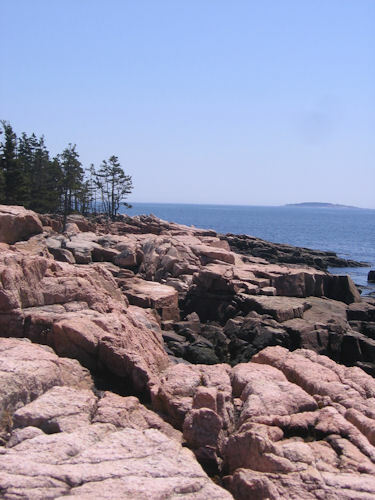 The rocks and pines are very reminiscent of northern Minnesota. 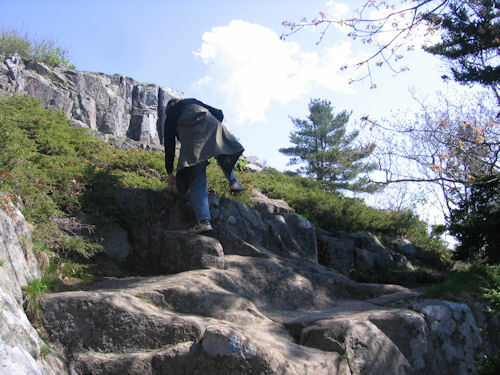 Some of the trails contain rock scrambles to keep on going. After the first day, we had nice weather the whole trip.